Marc-Andre Fleury will miss tomorrow night's game against the Boston Bruins and potentially much longer with a concussion. As Pens fans know better than most, there is little way to gauge how long he could miss, though given that he's self-reported not feeling well and there's no singular traumatic event it would seem more likely to be a short-term absence. Early indications are 1-2 weeks, though concussion timelines are much harder to diagnose than broken bones, pulled muscles, or torn ligaments. Fleury has been instrumental in keeping the Penguins' season afloat given the issues they've been working through in the early going, and it is his level of play has kept the Penguins within striking distance of the playoffs. New head coach Mike Sullivan gets his first major challenge leading the Penguins, and it's arguably the most difficult thing he could have had to deal with. Also losing Beau Bennett to an upper body injury last night that will sideline him for 4-6 weeks, Sullivan even more needs to help the Penguins drive play into the other team's end and try to outscore a bad defense that no longer has Fleury to prop them up. Jeff Zatkoff will likely be the next man up to see if he can continue some of the success he's had this year in a small sample size, but it's unlikely the team will be able to ride Zatkoff for a long period of time like they were able to with Fleury. It's also possible that prized prospect Matt Murray gets a chance to see what he can do in net for the Pens. With a 1.84 GAA and 0.938 SV% in 17 games this year for Wilkes-Barre/Scranton Murray has earned the right to get a taste of NHL action in a situation such as this and test himself against the best in the game. 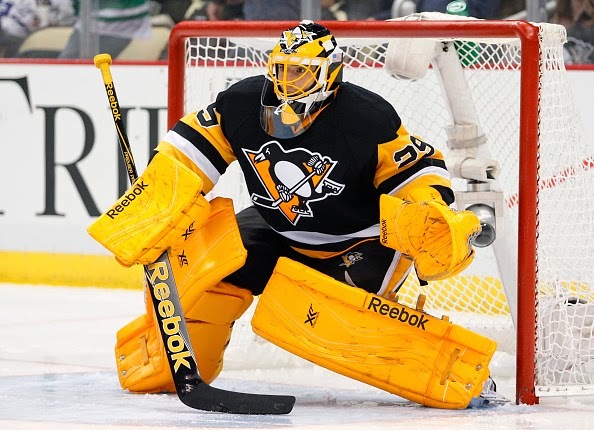 UPDATE: The team has announced that Fleury will miss 1-2 weeks with a concussion.